I know I post a lot of smoothies. However there are always new creations that I try, fall in love with and die to share! Plus, I really think it is a great way to pack in a lot of nutrition, can be extremely healthy and often filling. Furthermore, most of the time it is stuff I enjoy with the kids and find they drink it up. So why not? Given it is summer, aka cherry season, we have tonnes of cherries around. 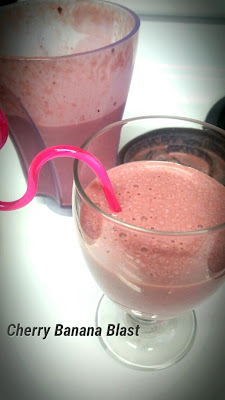 I wanted to make a cherry pop but ended up playing around and created this fun and yummy smoothie. Both Rayna and Caiden loved it! 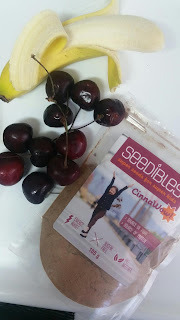 I also had a packet of Seedibles, CinnaWow flavour, that I wanted to explore. Seedibles is a Vancouver based company, by two moms, that sought to create a food product that is packed with essential nutrients to be added to meals so that even picky eaters get much needed fibre and protein, etc. This CinnaWow blend, looks and tastes like cinnamon, and combines hemp seeds, flax, quinoa, amaranth and cinnamon. So this product provides a tonne of nutrition being seeds and grains. It provides 4g of fiber, 2g protein and 3.5g of unsaturated fatty acids per serving...awesome. Anyways, here is my cherry banana blast recipe. It is delic. Thank you for reading turningmommy, I look forward to hearing from you. This blog may contain affiliate links. As such, Turning Mommy may receive a percentage of any product or service you purchase using the links in the articles or advertisements. You will pay the same price for all products and services, and your purchase helps support Turning Mommy. Thank you!